As you know, the story of Mata Nui has ended, and Lego has gone back in time to the ancient island city of Metru Nui. Of course, the heroes are still based on the same six elements: ice, fire, water, air, stone and earth. Whenua has a love for the history of Metru Nui and wishes to learn all he can about it. He is not as bold or confident as the other Toa, but his caution often saves others from harm. He is known for his fairness and good judgment, but is not comfortable with Toa Nuju or Toa Vakama because of their desire to look into the future. Lego's Bionicle line just keeps getting bigger. Yes, there are ever-increasing numbers of sets and more fans all the time, but that's not what I mean: the actual toys are larger. The original Toa were about 6" tall, but the main characters keep stepping up in size so that we now have 7 1/4" Toa Metru. And yet these guys were the little tiny Turaga in the original line? It seems that Whenua is just like your grandpa: he shrank as he got older. Back in the days of the Turaga, Whenua was the shortest of the group. To give this new figure a bit of continuity to the old line, he's still the shortest - his waist brick extends further into his torso than any of the others', and his neck joint is flat. Maybe it's from always being hunched over in those subterranean tunnels, but the Earth guys always get the short end of the stick - no pun intended. Last year the Rahkshi became the first Bionicle figures with knee joints, and now the Toa Metru add elbows. 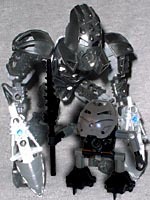 The original set of six moved only at the shoulders, hips, ankles and wrists, and while Whenua maintains all those joints, he also has a balljointed neck, making him one of the first Toa who can look side to side. Whenua's body, like all the Toa Metru, is a brand-new style. While it's closer to the Throwbot and Roboriders that preceded this line, the new scaffolding-like body seems to have lost the "Bio" part of the "Bionicle" name. 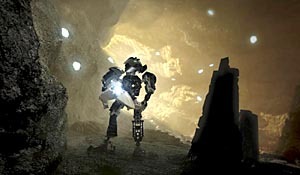 There are two gears embedded in his chest to make his arms swing, allowing him to attack the Morbuzahk. 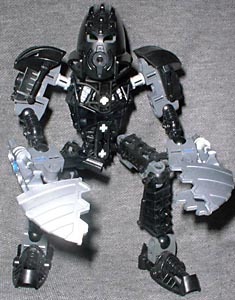 Onua, the original Toa of earth, had two gears in his shoulders to allow both arms to swing; a rarity, since most of his companions only had one. Now that all the Toa Metru have this double-armed capability, Whenua just doesn't seem as special. To help fight off the plant plague that is threatening his island home, Whenua comes with a pair of big gray... shovel... things. They're officially "Earthshock Drills," but they hardly look at all like drills. They most resemble the type of large shovel on a backhoe or other piece of construction equipment. 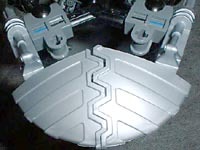 The "drills" can plug together with the help of a few extra pieces. They fit together nicely, but still just look like a shovel. Out of all the earth Toa, Onua's original claws are still the best. Whenua oversees perhaps one of the most fascinating districts in Metru Nui. Onu-Metru is home to the largest facility in the city, the Archives. A massive museum housing millions of objects and specimens, the Archive is the ultimate representation of Metru Nui's past. Before becoming a Toa, Whenua was an archivist - he studied the past, but now he's one of the most powerful Toa around. Since the Bionicle story is not focused on collecting masks any longer, Whenua's kanohi plugs quite securely into his face. Though it doesn't bear much resemblance to the old mask, it's still got a good design - the bumps on the forehead look like they'd help with tunneling, and the tubes on the sides could almost be lights. In his days as Turaga of Onu-Koro, his Ruru gave him the ability to see in the dark - as a Toa, he can also brighten the entire room. I wasn't crazy about the Toa Metru when they were first revealed: beyond the weird scaffolding bodies, they all looked like the same construction; the original Toa had variety in their construction that helped sell their personalities, but the Toa Nuva wiped that out. However, the Toa of Metru Nui have more variety than it might seem, and the new poseability gives them more play value than any Bionicle sets before. Whenua and his fellow Toa Metru have won me over. What's up with those weapons? Tell us on our message board, the Loafing Lounge.